Please DO NOT deeplink to this page and read my legal page. First sight Sniper and the KGB myth. My Photosniper... A personal opinion. The FS-3 Grey Sniper Enigma. The Different sets of Photosnipers. The PhotoSniper manual (FS-3 Zenit-ES). 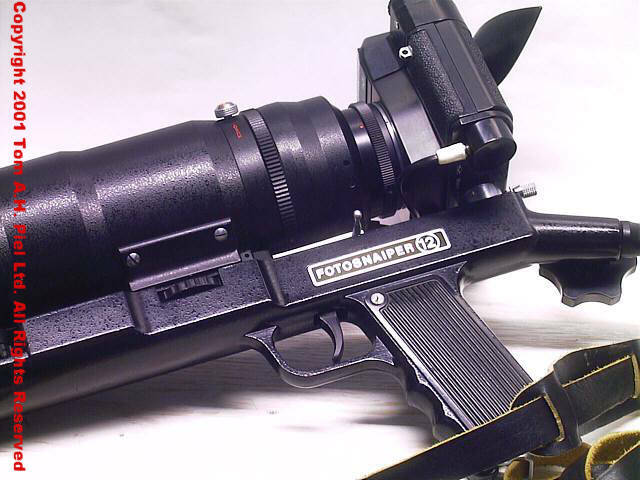 FS-2 Or Fotosnaiper The Early years. At first glance it's a strange and intimidating set. The choice of combining a gunstock with a camera seems logical. Unfortunatly carrying this through the city of Amsterdam invites arrest. From afar it looks like some kind of grenade launcher. Saying "it's only a 35 mm" does not really help. But seriously, for people shots, the Sniper is just not the thing to use. It's looks just too much like a rifle or some kind of weird raygun. Besides that it's not really a camera that blends into the background. It really stands out in a crowd. And it's hardly suited for unseen streetphotography. But there are several myths around the Sniper and I want to debunk them. 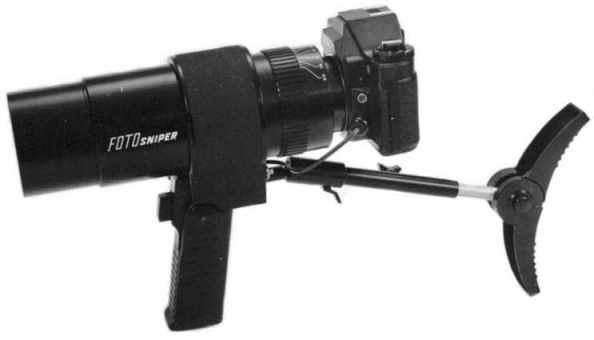 Was the FotoSnaiper designed by the Seventh Chief Directorate of the KGB? Which is know as "the spy shop" ? No, it was NOT designed by the KGB. It was made, like all Zenits by KMZ in Krasnagorsk in the outskirts of Moskow. Does the "Seventh Chief Directorate" exist? Yes it does exists and it is know as "the spy shop". Which turns out incredible and delightfull spystuff. Did the KGB use the FotoSnaiper? 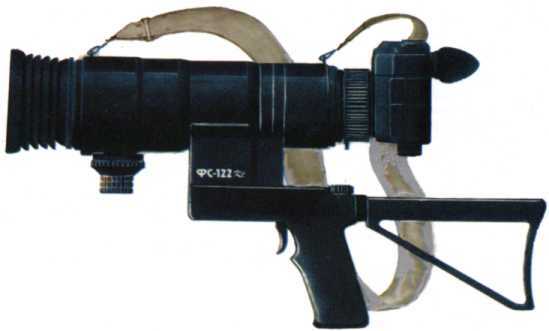 The Second Chief Directorate of the KGB (internal affairs within the FSU) did use the FotoSnaiper on survailance missions and on Stake-outs. The Russian Border Guard also was known to use it. An intersting bit of info is that the Russian Border Guard worked with the KGB on occasions. But I really doubt if they were used by the KGB outside of the USSR. 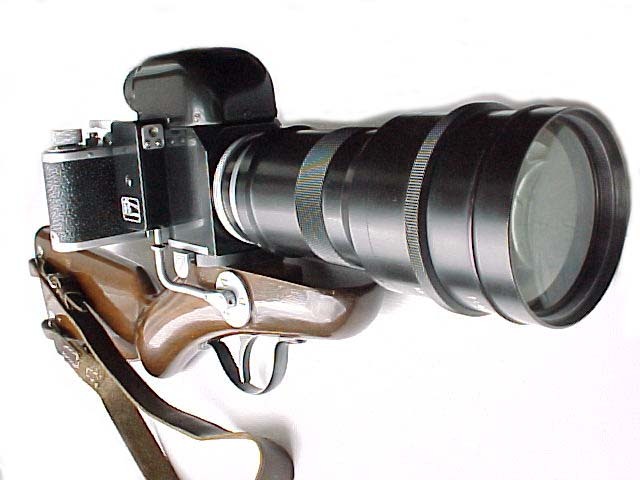 During the Cold War Era anyone carrying a Russian camera would be automaticly suspicious. And the Russians were and still are capable of turning out great Spy cameras. And if that fails ... nobody suspects a tourist. So... another myth blown away. To give a bit more insight into the KGB Directorates, here they are. Dissidents, political, social and cultural. Surveillance equipment, also known as "the spy shop"
During the sixties the KGB was reformed and the Fourth and Sixth Chief Directorates merged with the Second Chief Directorate. Essentially leaving 7 Directorates untill the KGB was disbanded in 1991	and rebuilt into todays FSB (Russian Federal Security Service). Also in 1991. 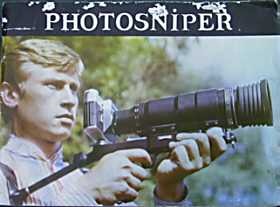 The photosniper was made exclusively for the Red Army. Sorry, it was sold both in the east and the west. So no exclusive stuff. It is possible that the Russian army used them. The Russian Border Guard did use them. But we are talking about small numbers here. Bottomline? 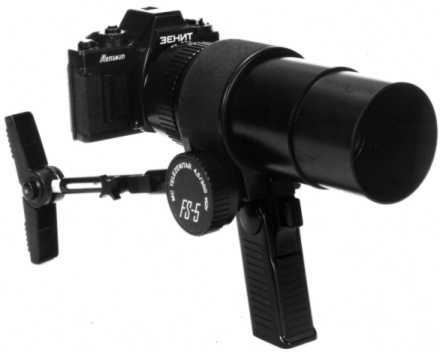 The KGB did NOT design the FotoSnaiper. Yes, they did use them occasionally. 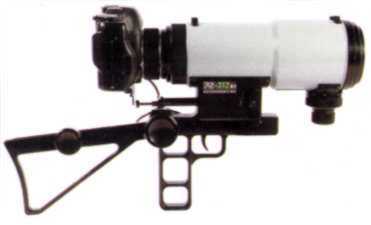 The Russian Border Guard has used the FotoSnaiper on some occasions. So don't get fooled if someone tells you that it was a Spytool. It wasn't and even if it was used by a spy, how could you tell? You can't. If you want one you can still buy this system and it will set you back around 250 to 350 dollars for a NEW FS-122 (complete set, two lenses 50 mm and 300 mm, filters, camera, gunstock and case). KMZ also has a new system called the FS-312KT. I don't know if it is in production yet or if it is ever going to be. But it is nice to see that the "Sniper" is still sold. Second hand is another story. I've paid about 210 dollars for a FS-3 in almost perfect condition with a Zenit ES with a WORKING lightmeter. I paid 155 for a FS-3 with wear and tear and a defective lightmeter. One 12XPS with a repairable lightmeter rest of the set is ok, but lacks the filters. I paid 105 dollars for that one. And one I bought just recently, just the gunstock with the lens and the camera a 122s, again a lightmeter that does not work I paid about 90 dollars for it. I also heard a weird story of people on an auction paying up to 600 to 900 dollars for it. There is even a website that charges 695 dollars (US) for a FS-122! Don't fall for that one. But what was it designed for??? In a single word? Wildlife photography. This is actually the main use for the sniper system. 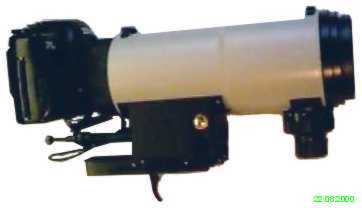 A telephoto system that was designed to be portable and stable. No, this is not a photo of my long lost cousin from Russia. It's the original export manual for a PhotoSniper Set (See pictures in the specificationslist). At present I have 2 complete PhotoSniperssets and two incomplete ones. Two FS-3's (Zenit-ES lightmeter shot on one the other is off by 2 stops both repairable), one FS-12-3 with the Zenit-12XPS (lightmeter shot) and one FS-122 with the Zenit-122S (working I fixed the lightmeter). But let me tell you the story of Tom Tiger and the PhotoSniper. In may 2000 I was looking for a few new lenses to rebuilt my old Zenit-E. Because it was a fun camera to use and I was finally working with manual cameras again. I went to several camerastores and dealers when I found a camerastore selling second hand cameras. Now, being interested in Russian stuff (and not just cameras) they showed me the FS-3 PhotoSniper. I bought it straight away, it looked to cool not to get. It consisted of a Tair 300 mm (light grey lens some weird kind of enamel paint), a Zenit-E SLR not modified and offcourse with a nonworking lightmeter, several filters (including some weird dark Solarfilter), an Helios 44-2 58mm/2 lens, a teleconvertor, metalic case and the gunstock cameramount. Being absolutly the most stable mount I've ever encountered with the exception of the ever trusty tripod, which isn't as portable or fun. In these photos the difference between the E and the ES is clearly shown. The first one is the eyepiece of a normal E. The second shows the ES and E's bottom. Note the extra shutter button. Last two shots are the eyepiece of an ES. With and without the rubber eyecup. both the lens and for triggering the camera. The first Photosniper gave me a few problems. a bit of paint and that was it. The camera was another problem, some parts had to be repainted, refitted with new covers and tested. Now the lens is one of the best I've seen. The Tair 4.5 300 mm (3s) is one of the best lenses I've had my hands on. No vignetting, no cushion or pincushion effect. Seems to be quite sharp as wel (most important). I also repaired the lightleak in the camera. So now I have two working Snipers, except for the lightmeters. One is dead and the other is 2 stops off. But I can repair this. Strangely enough, I've never seen anything that comes close to a PhotoSniper set (except for some exotic brand called Novaflex) which is odd, because it's one of the most stable systems I've ever seen. I once heard that there are more systems like this, so I really like one for my Canon. It would be great for Airshow photography. I'm thinking about making a baseplate for my Canon so it can fit the Sniper Gunstock. I tested the PhotoSniper at the harbour in Amsterdam. Here I found the only disadvantage of the system. The weird looks you get when you assemble the system and take aim. I got really foul looks from some custom officers driving by. On the other hand it can be difficult to explain carrying half a gun through the harbour. 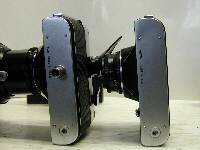 From left to right, FS-3 early version (grey) in it's case and later version (black) with the Zenit-ES. Last photo on the right are the two next to eachother. 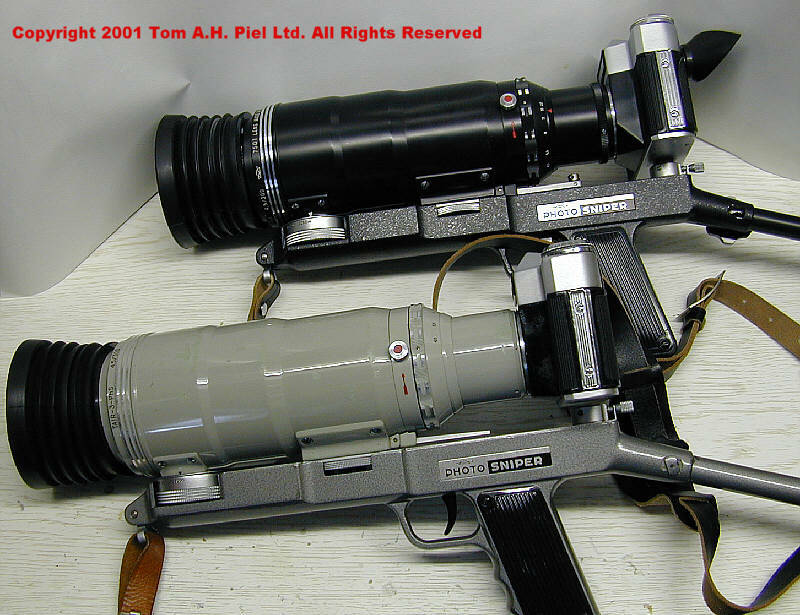 The Grey Sniper FS-3 is aside from the FS-2 the rarest version of the FotoSnaipers. Allthough they were built for almost 4 years (the first black snipers came in 1969/1970) We can try to retrace it by calculating the number of units produced in 11 years productiontime (1965 saw only 15 units built) which is 8902 units a year. This means that 35623 Grey snipers exist and 62315 Black Snipers. This first number is most probable less as we do not know if the number includes the sets without the cameras. And it is not exactly known when KMZ switched from Grey to Black. We also do not know the production numbers for the 11 years that the FS-3 was made, except for the first year. But it is safe to say that the Grey Sniper is the best looking one of the FotoSnaiper bunch. All versions are black. The FS-2 came in black and olive drab. The Grey Sniper is the most colorfull of all the Snipers. Grey metal case, grey lens, grey filters, dark grey stock and light brown leather straps. The Gunstock is grey hammerstrike paint. The lens as seen in the shots is lightgrey. It is rumoured that the FS-3 came at first with the Zenit-E (not modified). This Grey version is recognized by the messing or copper knob that holds the lens in place in the case. Only few were made because they were replaced with the Zenit-ES. Same casing. I've heard that later Grey Snipers have black knobs to hold the lens in place in the case but I haven't seen them. It could be possible that this Sniperset as seen in the first two shots is one of the first Snipersets made. Unfortunatly I will never be sure of that. Personally I don't think so, I suspect that the camera on this set was replaced. The camera dates from 1967. The Grey version was made from 1965 up to 1969 (1965 production numbers only 15 sets). The lens is a 3PhS. If looked at the dates it could be a first version. A low cost version pherhaps or a version to fill the productionquota. We will probably never know. It is not known how many sets of the Grey Sniper were built with the E. It is also not mentioned in Princelle. And this is the first time I've seen a (small) verification of this rumour. But nevertheless, it's interesting. Another rumour is that some Grey Snipers were sold without the camera. Some of these were modified for Pentax K-mount. Below you can see the different sets of the Photosniper system. This data comes from Princelle, who wrote the excellent "Authentic Guide to Russian and Soviet Cameras". Which is at this time one of the best books for research on Russian Cameras. 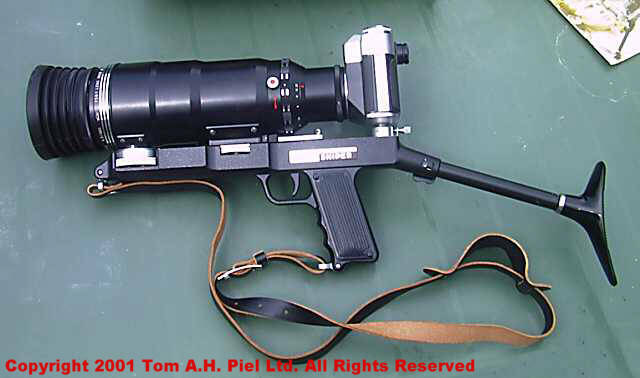 Even so there are still a few holes in the PhotoSniper history. But here is an interesting bit from Princelle. And I quote; "The story goes that Nikita Khrouchtchev, a famous amateur photographer and proud owner of a FS-2, went one morning to the neighbouring Krasnogorsk to have it serviced and was suprised that the factory no longer made them. The fist secretary's wish was granted in 1965 with the arrival of the Zenit-E. That year, 350 Zenit-E and 15 PhotoSniper outfits were to be marketed." End of quote. The Sets came under two different names as PhotoSniper or FotoSnaiper. 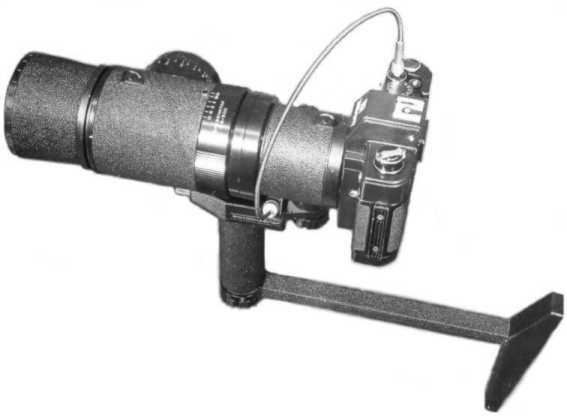 All production sets had the M42 universal mount with the exception of the FS-2 which used a bayonet type mount. FS-2, 1937-1943, Voomp-Goi, based on a modified FED body with a 300mm Goi lens. Later also made by KMZ from 1944 through 1945 equipped with the Tair 300 mm. Number of units made, less than 500 by Voomp-Goi, production of FS-2 by KMZ not known. 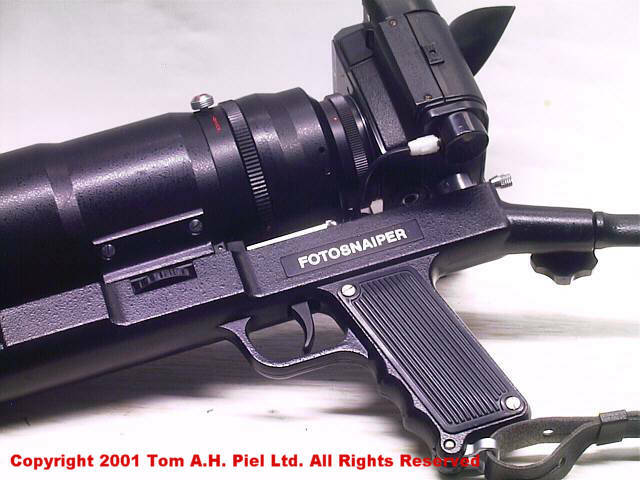 For more info on the very first of the Snipers see my FS-2 Or Fotosnaiper The Early years article. Wooden Gunstock with modified Rangefinder camera (now has a reflexcage). Very rare. 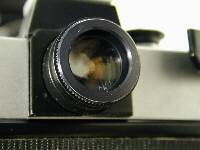 FS-3, 1965-1982 Based on modified Zenit-E called Zenit ES wit the Tair 300mm. 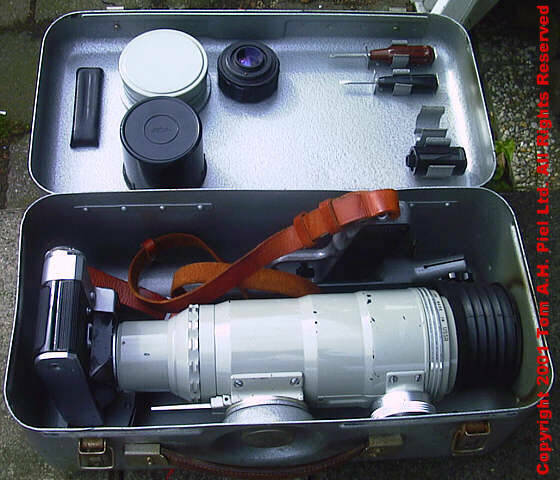 5 versions known, first version had a light grey lens and a light grey casing for lens and camera made from aluminum. It is rumoured that the first version came at first with the Zenit-E (not modified) this version is recognized by the messing or copper knob that hold the lens in place. Only few were made because they were replaced with the Zenit-ES. All later versions were black with black aluminum casings. This happened around 1969. Latin and Cyrillic versions exist. light grey Tair-3AS, light grey Tair-3PhS, Black Tair-3AS, Black Tair-3FS and a Black Tair-3PhS. Units made 97.923 by KMZ. FS-4, 1974 only 4 were made. Possible with a modified Zenit-TTL Lens was a Telezenitar 300mm (prototype?). The FS-4 never left the prototype stage. FS-4M, 1981 Based on Zenit 19 with remote shutter cable. Lens was a Telezenitar-M 300mm (prototype?). The rumour is and confirmed by KMZ's website that only 20 were made. Unfortunatly I also heard the rumour of 200 made. The FS-4M never left the prototype stage. 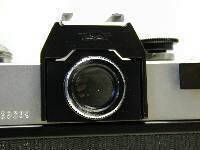 FS-5, 1985 Based on a modified Zenit Automat. Lens was a Telezenitar-K 300mm Gunstock can be folded up making the set more compact, unknown production numbers. This set had speeds from 1/2 s up to 1/1000 of a second. This could have made the FS-5 one of the best among the Snipersets. Unfortunatly, given the lack of info on the FS-5 we must assume that it never left the prototype stage. It's a shame, it could have been a winner. FS-12-1, 1982-1990 Based on a modified Zenit 12 (which was a new version of the Zenit TTL) called Zenit 12S. FS-12-1 seems to have ended around 1986. FS 12-2, Based on a modified Zenit 12XP called Zenit 12XPS (full metal camera) needle meter has been replaced by a 2 led system. Tair 3S 300mm Leatherlike case/aluminum casing. FS-12-2 seems to have ended around 1988/1989. 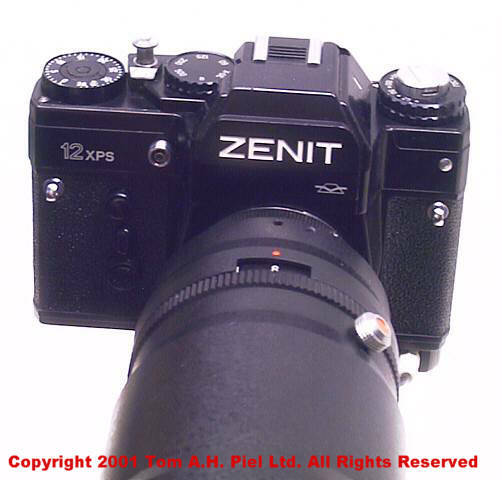 FS 12-3, Based on a modified Zenit 12XP called Zenit 12XPS but later version with plastic topcover for the camera. Tair 3S 300mm Leatherlike case. 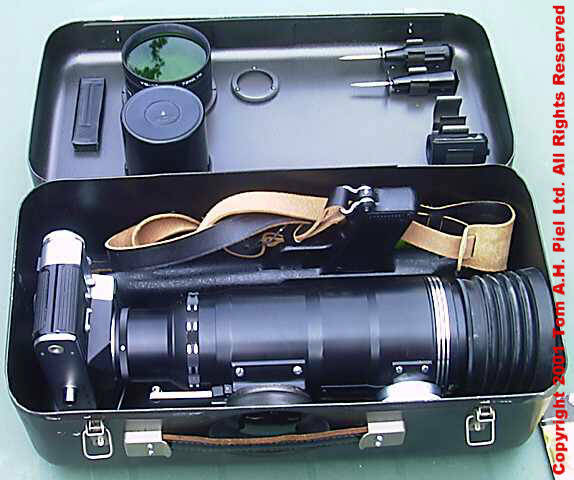 Standard lens in the case, Helios 44-4 or 44m-4 58mm/2. 110.000 of FS-12 series were produced. This could be the most produced Sniperset. Also this set is considered to be one of the finest and best Snipersets ever made. Several minor variations in text exist. All units came in black. Some came in all metal later ones came with the topcover in plastic. The Tair 3s has an open aperture metering system which connect to the 12's body by means of a cable. (On ALL FS-12 Series) Latin and Cyrillic versions exist. FS-122s, 1992 (still in production?) 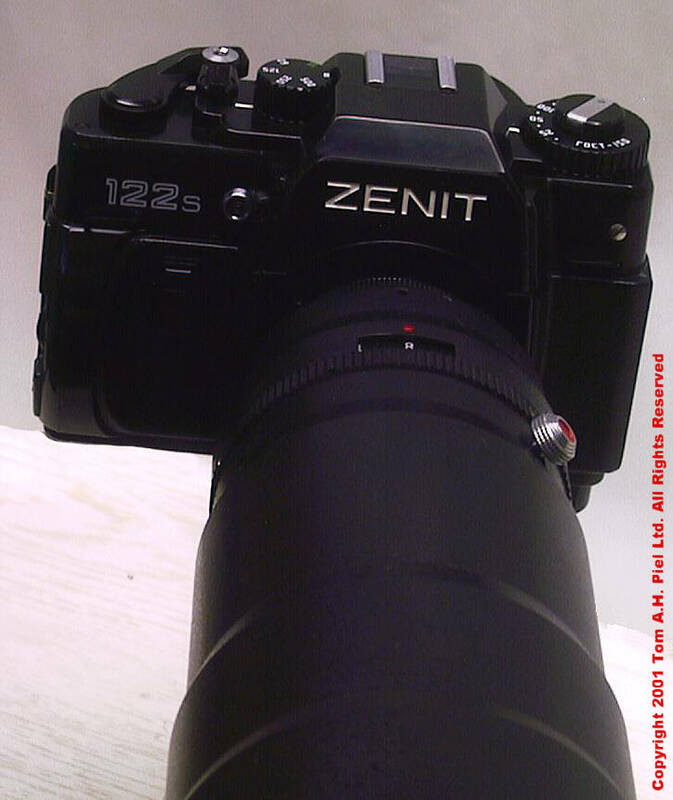 Based on a modified Zenit 122 called Zenit 122S. Tair 3S 300mm Leatherlike case. Production numbers are not known but numbers of 65.000 and 90.000 are mentioned. The units are now marked, "made in Russia" instead of made in the USSR. The Tair 3s has an open aperture metering system which connect to the 122's body by means of a cable. This unit is still sold today at a price of around 250 dollars US. Latin and Cyrillic versions exist. And one rare Souvenir version seems to exist. The last photo of the four is the prototype of the FS-122KT, new stock, the set would have been available in K mount, uncertain is an M42 version. It seems that the FS-122KT never left the prototype stage. Leatherlike case (possible marked Russian Federation). Productionnumbers unknown, possible limited production or pre-production series. Rumour goes that a FS-212ks was to be made. Again given the limited info on these sets we must assume that they never left the prototype stage. This set would have had slow speeds but no high speeds. Topspeed 1/500th. FS-312s and FS-312Kt, 1996 Based on a modified Zenit 312 called 312s, unknown if it is in production. It is mentioned on the KMZ webpage as being "New production". It breaks with the Black lens tradition and has a bright white lens which is clearly a new development of the Tair 300. The 312 is another version of the Zenit-122. So it has limited speeds. More abs plastics. 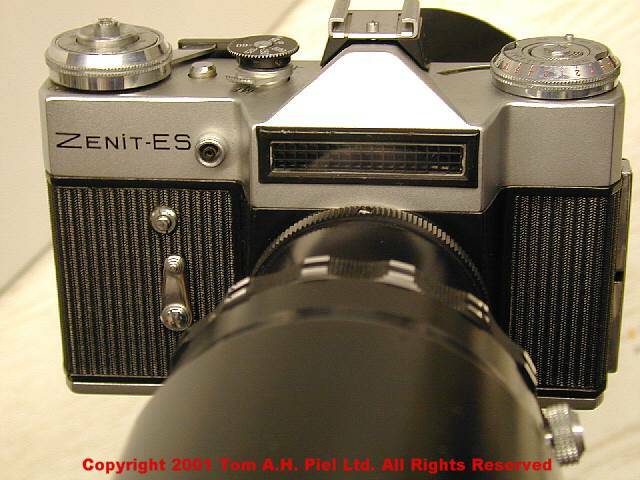 Shapes are more modern but let this not deceive you it's the same old Zenit-E/12 concept in a new jacket. Would if in production be available in two mounts M42 universal and Pentax K mount. Jean Loup Princelle for his fantastic book "The Authentic Guide to Russian and Soviet Cameras ". Also referred to as " The Soviet Camera Collectors Bibel ". 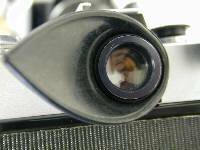 "Russian and Soviet Cameras (1840-1991)" a catologue by Yuri Ryshkov. Wojciech 'Jonny' Sawicki for donating photos on the prototype Snaipers and giving some great info. Isaak S. Maizenberg "All You Need to Know About Design and Repair of Russian Cameras, A Collector's and Repairman's Handbook"
Allthough Maizenberg does not mention the E-type he does covers the Zenit Krystall and the Zenit 3M. Which were the E-types predecessors. This book is a MUST for everyone who wants to repair their Russian cameras. It covers the first SLR's, rangefinders and has full info on calibration of rangefinders and lenses. Unfortunatly it is a rare and hard book to find. Whitout them this article would not be here.